Having Computer Problems?...You've come to the right place! Mike's PC Service & Repair is a quick, responsive and affordable solution to your computer-related problems. Wave goodbye to the "big-box" solutions where you are overcharged and under-appreciated. Mike's is a St. Louis-based company which focuses on finding simple and affordable solutions to get your computer up and running well again. We work on all kinds of computers including Dell and HP. 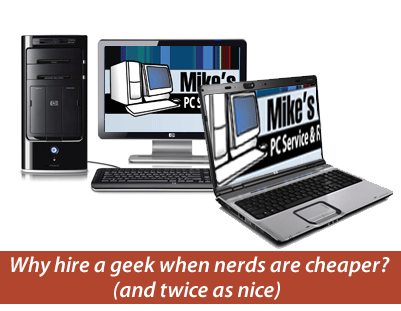 Here are a few reasons why you should consider Mike's for your computer service and repair. Save $10 on your computer repair by ordering online! We have less overhead than the "big-box" solutions to which you may already be accustomed around St. Louis. As a result, Mike's PC Service & Repair is able to provide a more affordable solution to fixing your computer. One of our greatest competitive advantages is our mobility. We'll come to your house or business and work on your computer on site. No need to unplug anything or deliver your PC to a repair shop, we'll come to you! If you'd prefer that we take your PC with us for off-site repair we can do that as well. We'll work with you to find a convenient solution to fixing your computer. We'll even work on it after hours or over the weekend! We're not in the business of "upselling" you additional products or services which you don't need. During our initial consultation we'll assess possible solutions and try to find a solution which fits your budget. We offer a wide variety of computer services. There may be times where additional memory or more processing power is the best solution for your problems but we'll never pressure you into purchasing anything.